I’ve never been a huge Valentine’s Day person. I don’t dislike the holiday, I just have never really cared much about getting flowers or gifts for it. I think it’s a million times more special when you get flowers or a card/gift on a completely random day and then you know that your spouse/significant other thought of you all on their own. Tomorrow, Valentine’s Day will flood my life via social media. Facebook, Instagram, Snapchat…I’ll see people celebrating their love, going out to eat, etc. I pray these people truly celebrate their love not just for Valentine’s Day but everyday, that they realize how truly luckily they are to wake up next to their loved one each day. I can’t help but think back on our Valentine’s Day last year. Erik never gave me flowers on Valentine’s Day. As I said before, I wasn’t into that and specifically would tell him not to waste the money on marked up flowers. He would surprise me with flowers on random days, no holiday needed. Well last Valentine’s Day, our last one spent together, he bought me flowers. He didn’t get the expensive ones from the florist, he put a bouquet together himself. Just the kind of thing I like! I still have those flowers. They are dried and kept safe. I can’t help but think that that wasn’t a coincidence that on our last one spent together he got me flowers. I now have flowers to keep for a lifetime from our last Valentine’s Day together. The picture above is the front of the card I gave him last year. I ordered it specially online because sea otters were his favorite animal. This year my stepdaughter said to me while we were in Target that we needed to get daddy a Valentine’s Day card. 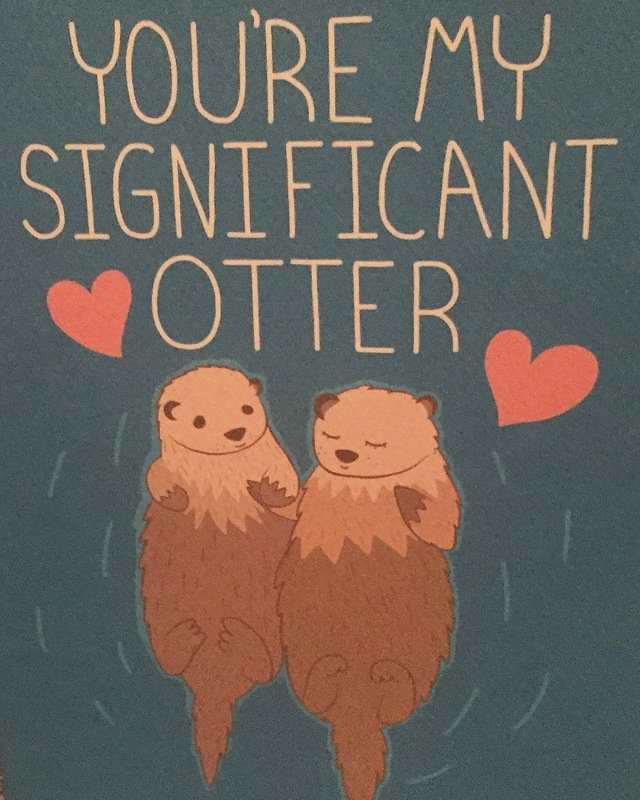 We headed over to the cards and there it was, a Sea Otter Valentine’s Day card!! It was not the same one from the year previous. What are the odds? So of course we got it! Tomorrow it will be my first Valentine’s Day without my love and in 18 days it will have been a year without him. Tomorrow I will still celebrate our love. I will take him cards, sit with him and be thankful for every moment spent together. We have a love that most people dream about. We loved each other through the good, the bad and the ugly and everything in between! I will forever be thankful that I experienced true love. Our time together was cut short but our love lives on and it will forever. So Happy Valentine’s Day everyone. Don’t forget to show your love and appreciation all the other days of the year as well! I share your feelings about flowers on Valentine’s Day. Any other day would be wonderful. And it is wonderful if some thought goes into it instead of getting roses because the florists want to sell roses. A bouquet Erik put together himself: much more loving and meaningful than something from a florist or jewelry store! Not many men are that thoughtful!